You can now set and forget your Free and Premium Ads on PostAdsDaily.com with this cool new feature to AutoPost Ads! Yes, you can upgrade at any time. Your new lot of ads will be ready to submit for a new 30 day cycle. You will be creating a subscription, to cancel the AutoPost Ads service please cancel the subscription payment within your Payment Processor account. 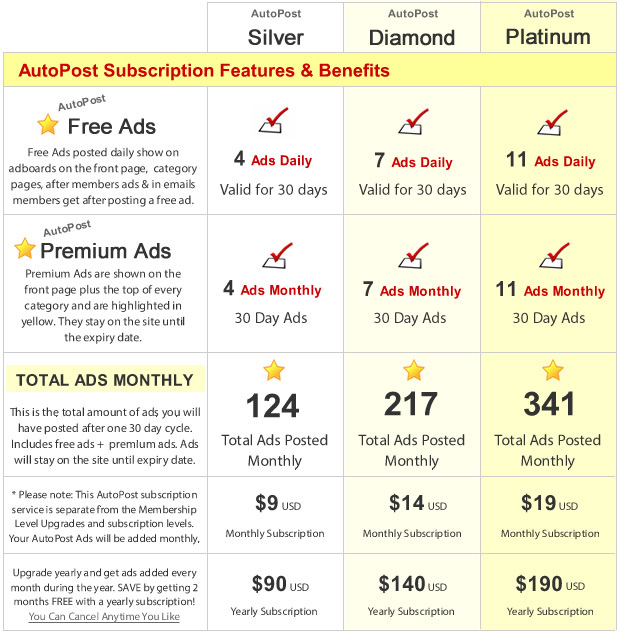 Yes, you can cancel your AutoPost Ads subscription at any time. To cancel the AutoPost Ads service please cancel the subscription payment within your Payment Processor account. Because affiliates are paid and ads are final, no refunds can be given for this feature. AutoPost Ads STAND OUT from the rest!